Shirts With Random Triangles: Behold! New Design For Proposed New Washington Redskins Home Stadium Unveiled. Behold! New Design For Proposed New Washington Redskins Home Stadium Unveiled. Behold! A model for a proposed new pleasure-dome for Daniel Snyder's ego stadium for the Washington Redskins. The projected cost: no man knows. Denmark-based architectural firm Bjarke Ingels Group (BIG) was recently commissioned by Washington Redskins owner Daniel Snyder to design a new stadium for the NFL franchise. (American architects are apparently not good enough for Snyder). 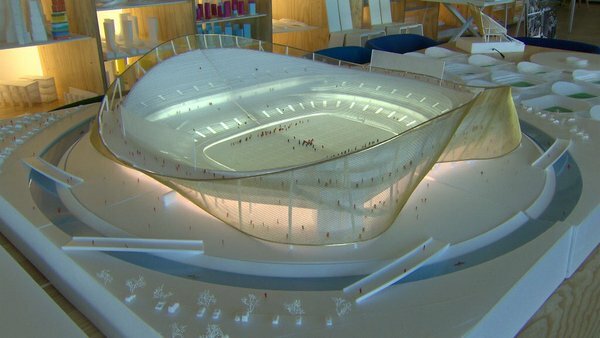 The result is this model described as "a semi-transparent hyperbolic paraboloid-shaped stadium." It comes complete with its own moat, reportedly intended for use by kayakers who's rather paddle their watercraft watch a football game. The new field of the new stadium is colored white, though presumably it was be the normal green-colored field in real life, as the NFL would probably not be down for such Boise State-style hijinks. There's no timeline set for construction of the new stadium to begin, nor has a location been selected. Getting it approved may be difficult, as Washington D.C. Mayor Muriel E. Boswer is more concerned about getting the Redskins' team name changed to a presumably less-racially charged name. The unveiling on the stadium's design is part of a 60 Minutes interview with Snyder, the Redskins' controversial owner, which is scheduled to air this coming Saturday.